Module Label: this is the label that you want to set for the following configuration, you customers will see it in the left sidebar module list and all the actions related to this specific module configuration. Is Enabled: this check allows you to enable/disable this module configuration if disabled the customer won't be able to access it. Icon: choose which icon should be used to represent this module, it will be shown usually with the module label all around the portal. Pdf Download Enabled: if checked will enable your customer to generate and download the PDF for the records available with this module configuration, the system is natively compatible with PDFMaker PRO, so if you had it installed and properly configured the PDF will be generated directly from PDFMaker, if you don't have it the standard vtiger templates will be used. Comments Enabled: this check is available for any module that has a relationship with comments in your crm, enabling it your customer will be able to see the record comments and write new comments. Upload Attachments Enabled: this check is available for any module that has a relationship with comments in your crm, it will be shown only if a configuration for the Document module is created in the portal and has with write permissions. Enabling it your customer will be able to upload documents directly in your crm, related to any of the records visible by this configuration. 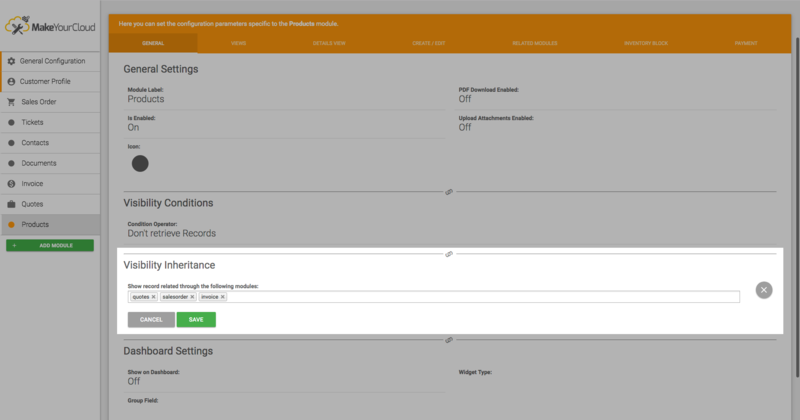 Show All Retrievable Records: if this option is selected then all the retrievable records present in your CRM for this module will be shown to the logged customers, there will be no visibility restrictions and it's not possible to set conditions. Don't retrieve records: with this option, no records will be directly retrieved from your crm, so the module main page will be empty, this option is useful if you're using visibility inheritance configurations for this module. 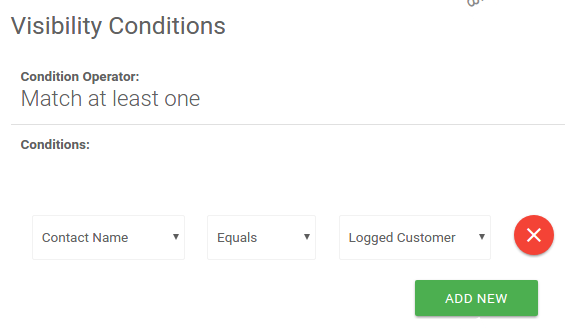 Match all Conditions: if this option is selected the Condition Rows block will be shown immediately after the Condition Operator block, in this case, your customer will see only records that matche all the specified conditions. Match at least one Condition: if this option is selected the Condition Rows block will be shown immediately after the Condition Operator block, in this case, your customer will see only records that matche at least one of the specified conditions. Target Field: here you can pick any field from the current module on which you want to create your condition row, there are special fields that will automatically change the Comparator and Target Value options, like Relationship fields with Contacts or Organizations, or user-related fields like the Assigned To field, also picklist fields are supported. Comparator: This is the comparison rule that will apply to this row, the options available in this picklist will automatically change depending on the Target Field value, for example, if the Target Field is a date field this option will contain Before, After or for numeric fields you'll have Is Less Than, Is Greater Than etc..
Target Value: This is the value that the field in question should have to match this condition row, this is also a dynamic field and his appearance will change depending on the Target Field value, for example for a date field you'll be able to pick your target value using a quick calendar picker, for picklist fields instead you'll see a dropdown showing only the allowed values, if the Target Field is a relationship field with Contacts or Organizations then here you'll be able to set "Logged Customer" or "Logged Customer Organization" value, so will be shown only records that has this field related to the logged Contact or Account. 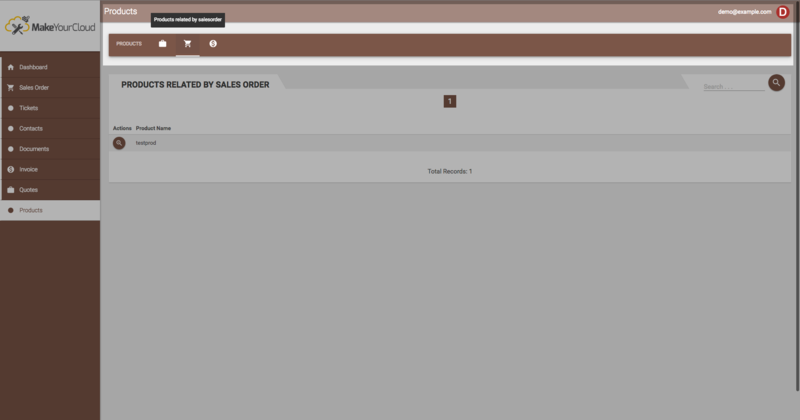 Using the visibility inheritance feature you'll be able to show records to your customers even when a direct relation field with contact/accounts is not available for this module, a really common example case is with Products/Services module, usually you don't have a "Contact" relationship fields in your Products module, but the relationships, in this case, are set by invoices, quotes or sales order, or at least many-to-many relationship in the contacts module, in this case must use the visibility inheritance feature to show to your customers his related products. This parameter is a multiselect field and will allow you to pick inherited records from any configured module in the portal that has a many-to-many relationship with the current module, for example you could show documents related through the "Related Documents" tab in the Quotes Details in your crm, but to do this you need first to properly configure the Quotes module in the MYC portal configuration area. Show on Dashboard: this is a sample toggle field that will allow you to choose if the infos from this module will be shown or not in the main portal dashboard. Totals Count: it will simply show the total of records available for this module configuration, if a group field is specified then the count will be grouped by such field. Bar Chart: this will show the records count in a Bar Chart, grouped by the specified field in the Group Field option. 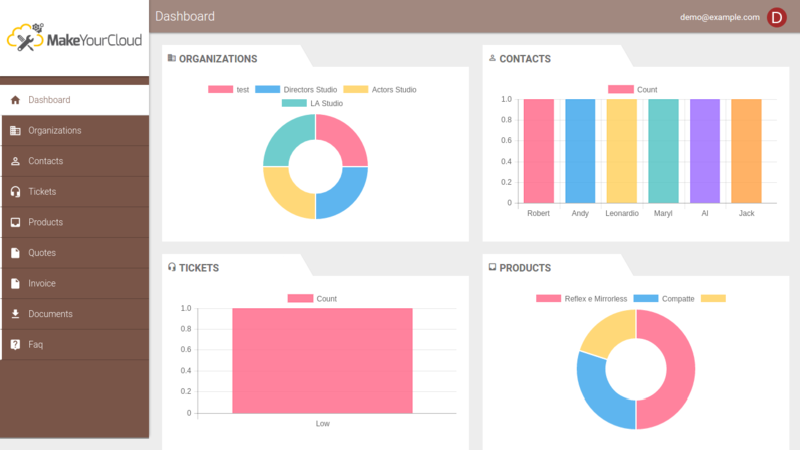 Doughnut Chart: this will show the records count in a Doughnut Chart, grouped by the specified field in the Group Field option. Group Field: This is the field that will be used to group the available records in the chart visualizations, for example you can show a Bar Char for the Quotes module grouping the records by Quote Status.